For almost 30 years, visitors from all over the world have flocked to Queensland's Fraser Coast to experience one of the most unique wildlife encounters on earth. 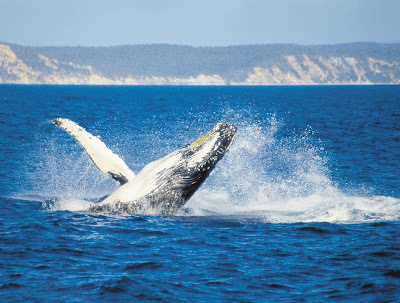 While there are a growing number of whale watch tours that can offer glimpses of whales as they swim along Australia's east coast on their way back to Antarctica, the Fraser Coast continues to be the only place where visitors are guaranteed front-row seats to one of nature's greatest shows. 1. There are only two places in the world where whales play- and Fraser is one of them.. Having completed their northern migration to calf in the warm waters of the Great Barrier Reef and started their return journey home, the protected waters on the western side of Fraser Island and the Great Sandy Strait provide the perfect spot for pods of whales to kick back and relax and- as with all trips to Fraser- there's plenty of fun for everyone. Mother whales teach their calves important skills they will need in cooler deeper waters, while curious, juvenile whales like to explore and do a bit of "people watching", while some of the grown ups in the pod kick back, while others are there to party, throw themselves around and have a good time. There are different versions of this "guarantee" being offered to tourists right along the Queensland coast at various times of the year. As with many things in life, the devil can be in the detail. 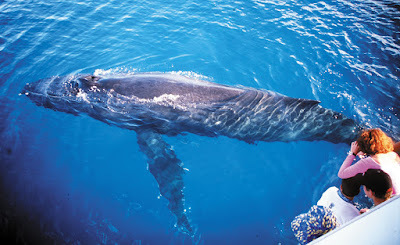 Under Queensland law, vessels are prohibited from approaching a whale and- in some instances- are not allowed within 300 metres of the mammals. Of course, while we humans have to comply with the laws, the rules don't apply to whales, who may wish to approach a boat and do some "people watching". This happens more often than not in the protected waters, where Fraser Island acts as a buffer from the surf, swell and winds of the open ocean. That's right. 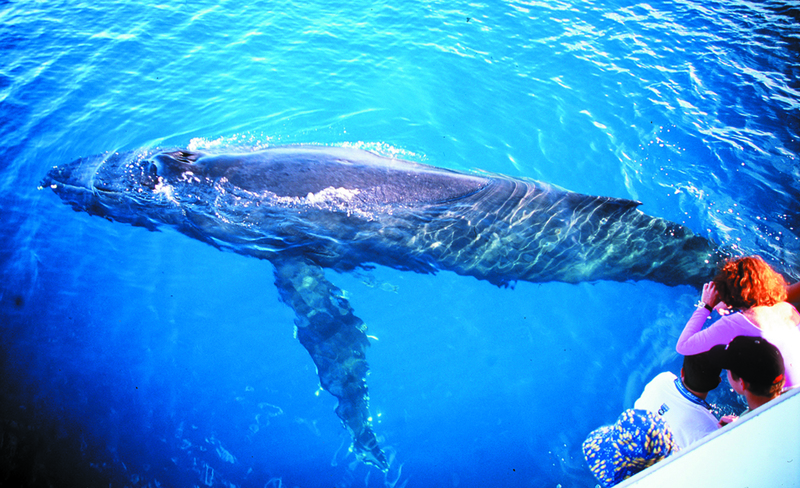 If you're keen to get right up close to these gorgeous giants of the ocean- and they feel the same way- you can book a spot with Hervey Bay Whale Watch to swim with the humpbacks off Fraser Island. This is a truly incredible wildlife encounter, offered by pioneers of the whale watch industry with close to 30 years experience. Visitors who want to swim with the whales should definitely book in advance as spots do fill up FAST. If you haven't been out on the open water in anything smaller than a cruise liner, or your sea legs aren't in the best shape when it comes to venturing out onto the sea- Fraser Island provides the perfect place to be able to enjoy some time out on the water with the whales. With the island acting as a buffer, the waters of Hervey Bay are often incredibly calm and inviting. Not only does this enhance your experience, it increases your chance of an up close encounter with a whale too. One of the other reasons Fraser is such a popular whale watching destination, is the opportunity to combine a breath-taking whale watch encounter with the chance to explore World Heritage-listed Fraser Island. To make this adventure nice and easy, the award-winning Kingfisher Bay Resort has created the ultimate package offering visitors 2 nights hotel accommodation, daily breakfast, transfers , a whale watch tour in Hervey Bay, a full day four-wheel drive tour of Fraser Island AND a third night FREE. 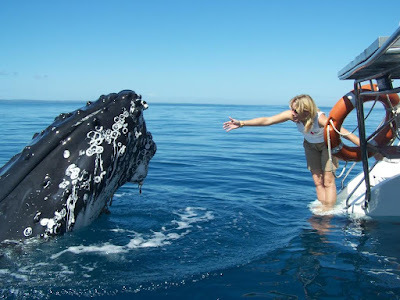 It's easily the best option for visitors who want the best of both worlds when it comes to experiencing Fraser Island and meeting Australia's famous humpback whales. Early bird specials are also available, meaning you can keep even more cash in your pocket to splash on your holiday.